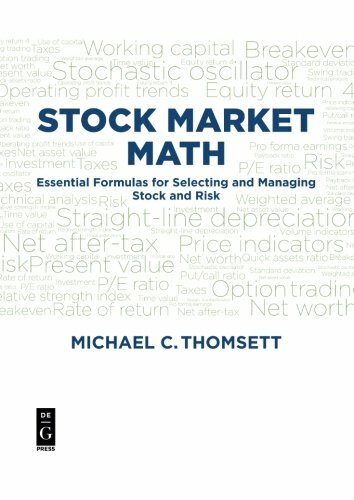 Stock Market Math shows you how to calculate return, leverage, risk, fundamental and technical analysis problems, price, volume, momentum and moving averages, including over 125 formulas and Excel programs for each, enabling readers to simply plug formulas into a spread sheet. This book is the definitive reference for all investors and traders. It introduces the many formulas and legends every investor needs, and explains their application through examples and narrative discussions providing the Excel spreadsheet programs for each. Readers can find instant answers to every calculation required to pick the best trades for your portfolio, quantify risk, evaluate leverage, and utilize the best technical indicators. Michael C. Thomsett is a market expert, author, speaker and coach. His many books include Mathematics of Options, Real Estate Investor's Pocket Calculator, and A Technical Approach to Trend Analysis. In Stock Market Math, the author advances the science of risk management and stock evaluation with more than 50 endnotes, 50 figures and tables, and a practical but thoughtful exploration of how investors and traders may best quantify their portfolio decisions. If you have any questions about this product by De G Pr, contact us by completing and submitting the form below. If you are looking for a specif part number, please include it with your message.